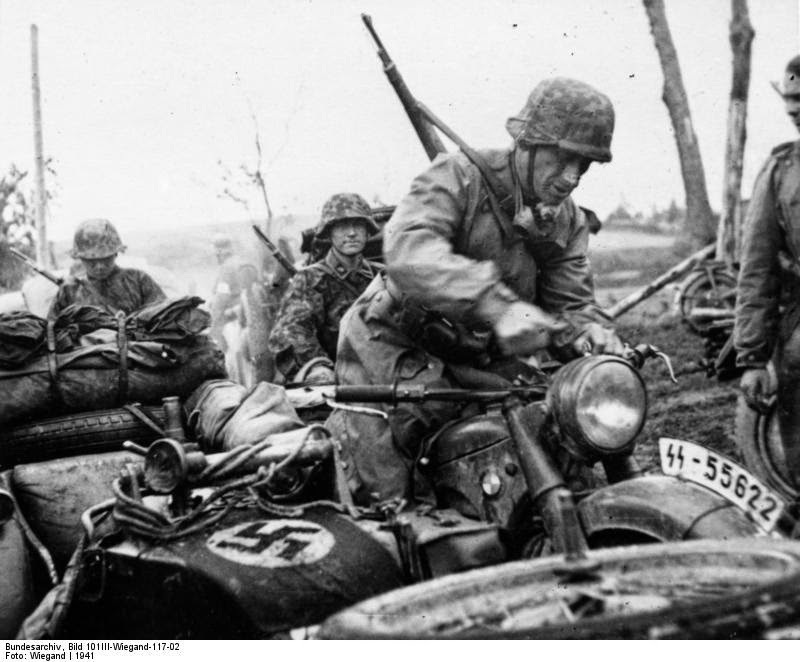 Motorcycle infantry of the 3rd SS Panzer Division on their way to Leningrad. In this section, the Illuminati plot to massacre the crowd at a rock music festival is revealed. And although the plot of the novel obviously is fantastic, it echoes real events in World War II. And here is a British newspaper article about the remains of many people being found at the bottom of a Swiss lake. There are other grim echoes of real life in Illuminatus! Page 473 refers to the "old fear" of the Russians that "Germany will once again, with the help of the capitalist powers, rise up and attack Russia and slaughter Russians for the third time this century ... " The first time, of course, was World War I, and the defeat was so bad it resulted in the overthrow of the Czar and the eventual capture of power by Lenin, who appears as an unnamed character in Masks of the Illuminati. And the second, as you know, was World War II, when the Russians suffered unimaginable slaughter. (Last summer was the 70th anniversary of the D-Day invasion of France by the western allies. An important event, to be sure, and I interviewed a war veteran, as did many journalists. But it was really the Russians who did the main job of defeating the Nazis, although I'd guess that only a minority of folks outside of Russia realize that.) During the days of the Cold War, one of the main armies of NATO was a big West German army assembled through conscription. "to get stoned and watch late movies on television," page 463. Watching late movies on American TV gave Joe Malik a built-in mash up, with lots of commercials, a replication of the cut-up technique invented by Brion Gysin and popularized by William Burroughs and used in Illuminatus! The early Surrealists in France used to run in and out of movie theaters to obtain a similar effect, and the late Beatle John Lennon enjoyed switching from channel to channel as he watched TV. "Otto Waterhouse must kill a white man." page 467. The assassination is ordered by Hagbard Celine, who thus winds up replicating the actions of his enemies (as Chas pointed out last time, in the comments.) Whether conscious or not, this is another echo of "the good war" — the Germans bombed cities but saw German cities largely destroyed in a more ruthless and deadly fashion, including Hamburg and Dresden in World War II. (No doubt many of you have read Kurt Vonnegut's Slaughterhouse Five, which includes the Dresden massacre.) The Japanese committed atrocities, particularly in China; many Japanese cities were pretty much destroyed in firebomb raids, not to mention Hiroshima and Nagasaki. Of course, it's also appropriate that Flanagan dies as a result of his own assassination raid. "It was the service entrance," page 467. The Black Mass that takes place previously in the work was in an apartment on the 17th floor of 2323 Lake Shore Drive. 1. In his memorial essay on Bob Shea, RAW mentioned that they'd come up with the Salem/Wolf Man bit while smoking dope together and he forgot it until Shea put in the book. 2. The dead soldiers under Lake Totenkopf are probably based on the dead soldiers who were made into cigarette filters in The Crying of Lot 49. The phrase "Otto Waterhouse must kill a white man," makes a great magickal pun!